As a small business owner, you’re aware that tax preparation can be nothing short of a perpetual nightmare, particularly during the early stages. Taking responsibility for your business strategy is crucial to ensure that you don’t conflict with the IRS. Thus, you need to manage all possible tax breaks to reduce tax liabilities for your business, which could rack up even bigger savings than you might be aware of. Year-end tax planning is crucial when it comes to managing exactly what you are expected to owe and strategically reducing it. One way to do this is to make philanthropy a big part of what you’re doing. Firms that are giving back to their community can take big tax write-offs. A good rule of thumb is 10 percent. Devote 10 percent of your total income to charitable causes, and this will help eliminate a lot of extra taxation. In doing your taxes and working to reduce tax liabilities, track office expenses like environmentally sustainable equipment, furniture, travel, and conferences. Keep accurate records throughout the year to maximize their deductions in this area. Refer to the IRS website for a list of acceptable deductions. It also pays to know what the IRS is willing to give out tax breaks for. The United States Federal Government is known for giving all sorts of a write offs to businesses that focus on employing union workers, minorities, manufacturing, and exports. Emphasize exports to get some great tax breaks such as the IC-DISC. 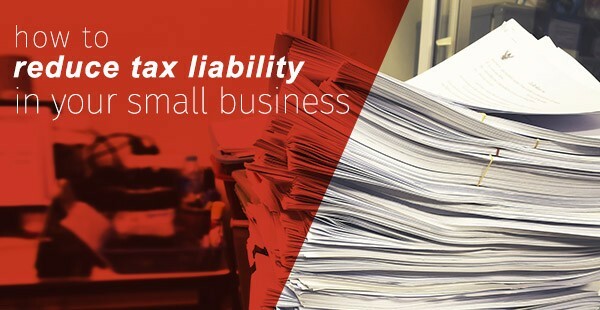 Accountable plans affect the tax liability of a small business. If you don’t have good records, do not count something as a deduction. The IRS might hit you hard if you didn’t honestly report your tax returns based on what you know. It is better to have fewer deductions but no IRS audit than to have many deductions and get an IRS audit. Go for simplicity and prioritize deducting major items. A good way to save on taxes for your business is for you to compensate your employees by raising your contribution to their health insurance. Instead of increasing their salary, it’s a better option to give the same amount to cater for their medical expenses. For instance, if an employer increases the employee’s salary by $350 a month, those wages would then be subjected to Medicare taxation, FICA tax, and income tax. Consequently, the employer will share the cost of paying Medicare, FICA and may have to pay out for federal and state unemployment. Thus, instead of giving an employee $350 more, the company can pay the same amount to cover their medical insurance. Doing so will eliminate FICA, Medicare, income tax, and unemployment taxes, and both the employer and employee will be saved from taxation. Trusted advice: Besides preparing your taxes, an accountant can act as a reliable advisor to your small business, assisting you with cash flow management, assess risk, keep your books in order, and plan for growth. Help with managing your business and personal needs: Many are the times small businesses such as startups and sole proprietors finds their personal finances and business closely linked. To make sound judgment for the benefit of both, an accountant comes in handy. Hiring a small business accountant to assist your taxation strategies is crucial. It will allow you to utilize wise planning to significantly reduce your tax burden and keep more of your money working for you.